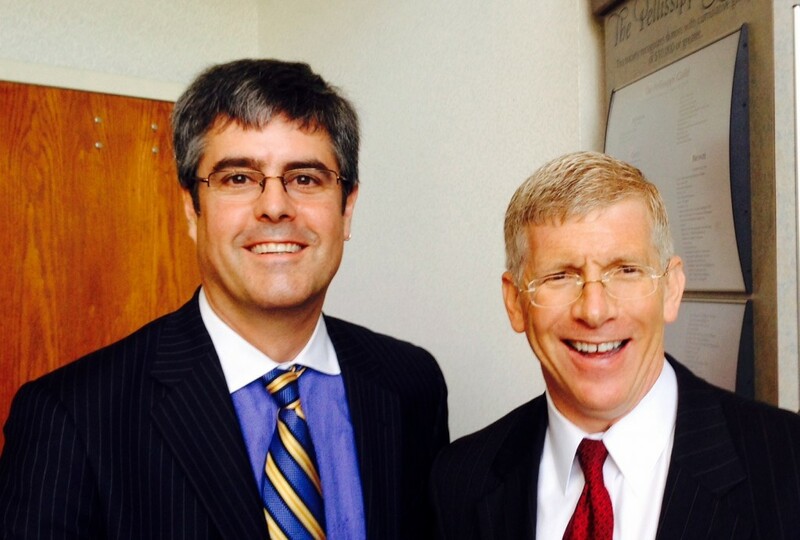 Oak Ridge National Laboratory Director Thom Mason and then-Deputy Energy Secretary Dan Poneman pose for photo following Aug. 15, 2014 event at Pellissippi State. Former Deputy Energy Secretary Dan Poneman’s appointment as president and chief executive officer of Centrus Energy Corp. (formerly USEC Inc.) has drawn attention and scrutiny from members of Congress and others. There have been questions about potential conflicts of interest because of Poneman’s former position at DOE and the ongoing relationship between Centrus and the federal agency. Among those asking questions is U.S. Sen. Lamar Alexander, R-Tenn., who is chairman of the Senate Appropriations energy and water subcommittee. “Sen. Alexander has asked for additional information from the U.S. Department of Energy,” spokesman Brian Reisinger said. Centrus communications manager Jeremy Derryberry confirmed that Poneman is restricted from talking with Department of Energy officials for two years from the time he left the agency last fall. Derryberry did not respond to questions about any restrictions between Poneman and Oak Ridge National Laboratory or other restrictions. Centrus serves as a subcontractor to UT-Battelle, the department’s managing contractor at ORNL, regarding the company’s work with the government-owned centrifuge technology. ORNL Director Thom Mason, who is president and CEO of UT-Battelle, said he did not believe there were any restrictions on Poneman’s communications with the lab. UT-Battelle is acting on behalf of the Department of Energy in overseeing the company’s American Centrifuge Technology Demonstration. Earlier this year, the lab exercised an option to extend the agreement through Sept. 30, 2015. The American Centrifuge agreement requires Centrus to provide ORNL with data from the centrifuge cascade operations at the company’s Piketon, Ohio, facility and from the centrifuge research activities in Oak Ridge. ORNL — DOE’s largest Science lab — has been a partner for years in helping the company develop the advanced technology for enriching uranium. He said the lab’s responsibility is to oversee the Centrus subcontract and the required “deliverables” associated with the agreement and make sure the technology is maintained in a safe and secure manner. Mason said there is an analysis being carried out by the National Nuclear Security Administration and DOE to determine what the long-term strategy should be for domestic uranium-enrichment capabilities. ORNL will provide input to decisionmakers based on data received from the American Centrifuge demonstration, he said. This entry was posted in Centrus, DOE HQ, ORNL on April 21, 2015 by Frank Munger.